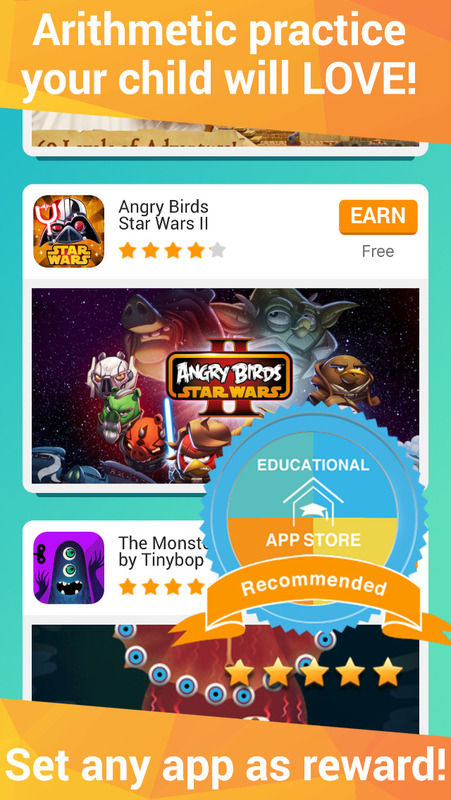 In this app, children can earn as they learn. It is built around offering children a real reward, in the form of new apps, for their efforts in developing their fluency and accuracy in arithmetic. 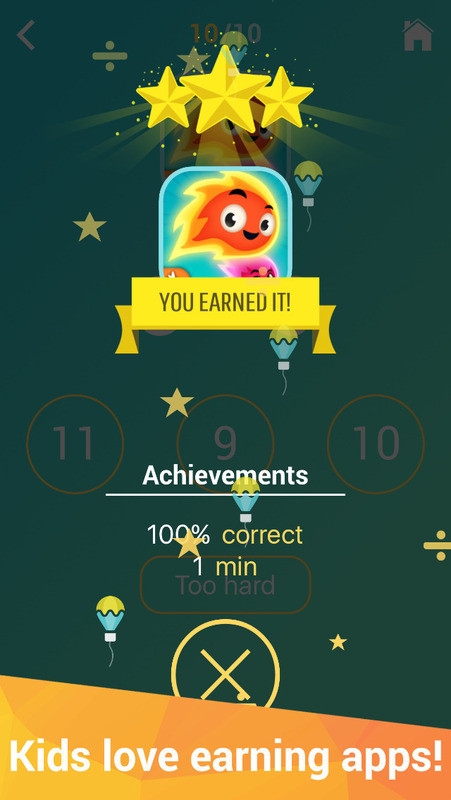 How should apps reward children for putting in time and effort to learn new skills? Some unlock characters and levels, some play an animation, and others award stars. This app offers what is likely to feel more tangible to a child - the chance to earn an app to download. Parents can follow a simple process to line up a list of apps, both free and paid for, that children can earn by engaging with this app to a high enough standard. This selection of apps is made by using the app store and so is from a huge array of choices. The value of the app can be reflected in the effort required to earn it as parents can set how many questions a child needs to answer correctly to win the app. There are three tiers to this mechanism reflecting free apps and then two pricing levels. Unfortunately, these levels are shown in U.S. dollars regardless of the user’s home region so you might have to do a quick currency conversion. The difficulty of the maths can also be set by deactivating certain question types. This all works very well and is both an original and well-executed idea. It isn’t as useful for school-based work as the rewards assume that a child is using their own device and has time to be able to enjoy their reward. At home, though, it is an excellent way to harness a child’s desire for new apps to improve their learning. One potential problem is that the settings are not fully isolated from the child and so a canny player might be tempted to make things easier. The app’s developers make it clear that this is an app for practising maths rather than learning it from afresh. Learning new skills requires that first we gain knowledge of them and then we refine and secure this knowledge through doing. 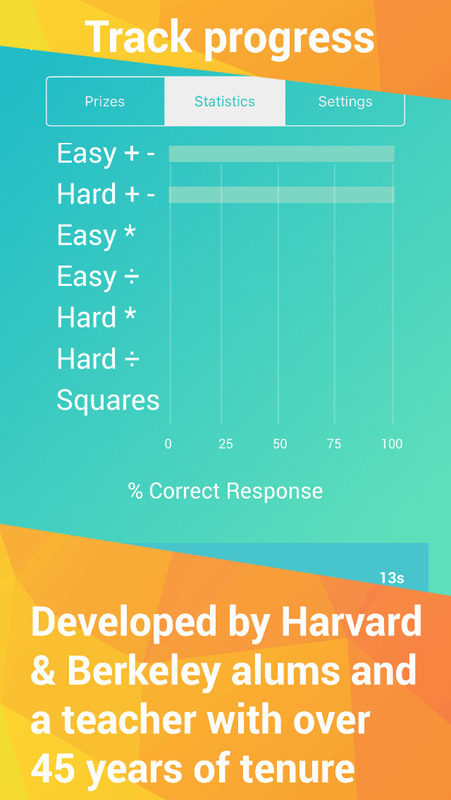 This app aims to help with the latter through rapid multiple choice arithmetic questions that evolve alongside the user’s skills. Questions appear and three potential answers can be pressed. The correct one takes the player a step closer to their desired app, as reinforced by a quick pulsation of its icon; an incorrect one takes them a step back from it. There will be no reward for random button pushes here. The question types are based on standard arithmetic and so children will work with addition, division, subtraction and multiplication. Square numbers are also covered as is the use of brackets within questions dependent on knowledge of order of operations. There is nothing particularly original in this regard although it is a well-executed activity that paces progression effectively. This quality is reflected throughout the app in its clear and attractive presentation. Parents of five to twelve-year-olds who find that they are frequently fending off requests for new apps may find this app an excellent tool for introducing to children the concept of earning what they want while securing the maths that they learn at school. 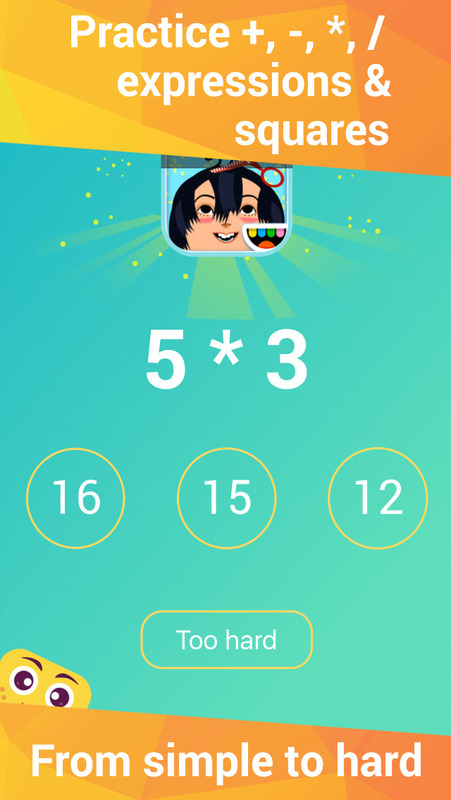 Math Wallet is a unique math game that allows parents to seamlessly motivate their kids to practice arithmetic. A parent gets to set any app from the App Store (free or paid) as a reward, that a child then earns by solving math problems. This reward system makes the process of practicing arithmetic fun, motivating and exciting for the child. Meanwhile difficulty adjusts automatically (within bounds set by the parent) starting form simple addition and subtraction, and progresses to multiplication, division, combination problems and squares. Math Wallet focuses on arithmetic practice, rather then learning. We believe there are a lot of wonderful teachers and parents to help kids learn arithmetic concepts, and Math Wallet aims to be a complement to this rather than a substitute, helping kids practice what they have learned. The game is also purposefully simple: the problems are shown in a similar format to how a child may see them at school, and assumes the child already knows numbers. What if you had a seamless way to incentivize your child to practice arithmetic on their iPad, as opposed to just playing games? With Math Wallet, all the apps you download for your child will also become an investment in your child's education! And it takes almost no effort on your part. A 2012 study by the Center on Education Policy found that "motivation is a central part of a student’s educational experience from preschool onward, but it is has received scant attention" and "higher motivation to learn has been linked not only to better academic performance, but to greater conceptual understanding." Math Wallet allows you to seamlessly harness kids' love for apps and make arithmetic practice exciting for them! Why should your child practice arithmetic? Not only will these skills help your child in school, but according to NYU's psychology professor Clancy Blair "solving maths problems improves the way your brain functions" and "can translate into an ability to earn more money and form stable relationships". 1) From time to time, your child will ask you to buy or download a new app. 2) Of course you could give in and let them spend your money. Or, you could turn this into a learning opportunity! 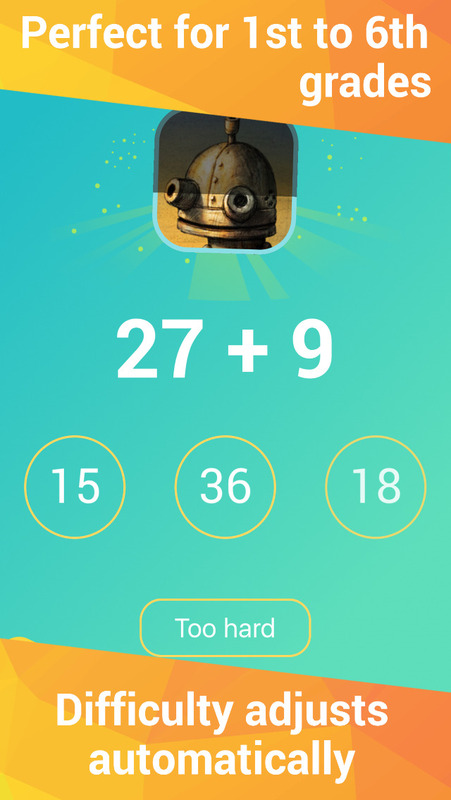 3) Seamlessly set a reward and have your child solve math problems to earn it. Based on machine learning, the level of difficulty will increase as your child gets better. The math problems will seamlessly transition from simple addition and subtraction, to tougher problems like multiplication, division and squares while training your child. 4) But that is not even the best part. You are teaching your child that it takes work to get something. You are giving them an opportunity to be independent and earn the game that they want. 5) Once the child earns the set reward, it appears in the Prizes section. You can then easily download it from the App Store. The reward can be a free app or a paid one - you can choose any app from the app store. We have invested in developing a machine learning algorithm where the problems automatically become more difficult as your child gets better at solving them. It starts with simple addition and subtraction, becomes more difficult over time, and progresses onto multiplication, division and squares. You get to see analytics on how well your child has mastered each, and control the level of difficulty in the parent-only section. The team working on Math Wallet includes two Harvard graduates, a Berkeley CHSE alum, and a 73 year old math teacher with over four decades of teaching experience.